I first saw Archimandrite John (Krestiankin) in 1982 when I visited Pechory Monastery. At the time he did not make a great impression on me: the benevolent old man in rather good physical condition (he was already seventy-two years old) was always running here and there, a bit fussed, even . . . yet ever surrounded by a crowd of pilgrims. In comparison with him, the other inhabitants of the monastery seemed much stricter, more ascetic, and somehow more dignified. Usually before the start of the evening service a strange procession would fly out of the brothers’ quarters of the Pskov Caves Monastery. Father Philaret, the young econom or steward of the monastery, would take Father John by the arm and almost at a run drag him off somewhere so quickly that he could barely keep up with his cell attendant. Following this pair, immediately there flowed a crowd of pilgrims waiting for their chance to speak to Father John, right there on the street. And so they all ran, racing headlong through the entire courtyard of the monastery, their robes and Orthodox klobuk veils flowing, with Father John stumbling over himself now and then as he panted, out of breath, trying on the run to bless some pilgrims and simultaneously even managing to answer theological questions! Father Philaret would get quite angry about this, and would yell—sometimes at Father John, and sometimes at the pilgrims, whom he might even drive away with his umbrella. Finally he would drag Father John into the church and would lead him to the altar as quickly as possible. I should say that our young monastery steward acted this way not out of spite, but because he was concerned that in the cold winter months Father John might catch a cold. When the weather got warmer, there was a serious risk that Father John wouldn’t make it to the church at all, as sometimes he would be surrounded by people seeking his blessings for hours and hours. Together, my friends and fellow novices would watch the scene taking place day after day and would laugh heartily, until at last it began to occur to us that this seemingly humorous figure of Father John, racing after the irritated monastery steward, was actually one of those rare human beings on earth for whom the boundaries of space and time are shifted, someone to whom the Lord has given the gift to see the past and the future as clearly as the present. With complete surprise and not without awe we experienced this for ourselves. This man, whom some people mocked as “Doctor Aibolit” (something equivalent to a Russian Doctor Doolittle), was able to read the secrets of human souls, and all their hidden treasures, desires, deeds, and thoughts were open to him. In ancient times people like him were called prophets. We in the Russian Orthodox Church call such people elders. But Father John never called himself an elder. And when people would say something like that to him, he would wave his arms disparagingly: “What elders? We just happen to be old men who have experienced a few things!” To the very end of his life he was convinced of this, in keeping with his profound inner humility. And yet many of those who knew Father John were convinced that in his person the Lord had sent us a true elder, someone who understood the Providence and the mysterious will of God. Yes, this was the main thing about him: Father John was able to see the will of God as it concerned other people. But we novices did not immediately understand this. At first it seemed to us that this priest was just a very wise elderly man. Indeed, it was because of his famous “wisdom” that people would come from every corner of Russia to see him. It was only later that these thousands of people from all over the country would discover to their own astonishment that they had really come not so much for wise advice, but for something even more profound. In worldly life we are always surrounded by people willing to advise us from their own experience. Yet the people who would appear before Father John, usually at the most tragic and fateful moments of their lives, wanted to hear from him not just how to act wisely, but how to act with certainty, in the only correct way. To be precise, it was in his unique understanding of the will of God that this elder was different from all other people—even from renowned wise men, even from intellectual theologians, and even from the most experienced and wonderful priests. I remember when I was still just a young novice, one of the pilgrims from Moscow walked up to me and told me a story that he had just wit­nessed himself. Father John had been racing to church, thronged as usual by a crowd of people desperate to speak to him. Suddenly a woman in tears, holding a three-year-old baby, threw herself across his path. Then Father John made the sign of the cross over the boy. The pilgrim and I went off horrified as we reflected on this event. What if the priest made a mistake? What if the boy were to die? What would the mother do with Father John if something like that were to happen? We of course could not suspect Father John to be someone with principled opposition to any form of medicine, a phenomenon that, though rare, does occur in certain spiritual circles. On the contrary, he often blessed and sometimes even insisted on surgical operations. There were several famous doctors who considered him their father confessor and themselves his spiritual children. It was with dread that we waited for further developments. Would the mother of the boy come back to the monastery grief-stricken, stirring up a frightful scandal? Or would everything be exactly as Father John had predicted? Judging by the way the old priest continued to peacefully go back and forth on his daily path between the church and his monastic cell, we could only conclude that the elder who had given such decisive advice knew what he was talking about. And so it proved. Confidence and obedience are the main rules for a relationship between a Russian Orthodox Christian and his father confessor or spiritual father. Of course, not every spiritual father is capable of inspiring such complete obedience, and indeed, spiritual fathers of such caliber are extremely rare. So in fact this is a very complicated question. There have been tragedies in which unreasonable priests have begun to imagine themselves elders, and have therefore given cruel commands and arrogant instructions and, worst of all, have begun to commit that which is absolutely forbidden in spiritual life: to suppress the freedom and free will of your spiritual children. And always, as far as I know, those who did not take the advice of Father John would bitterly regret their stubbornness in the end. And, as a rule, the next time they would come to see the priest with the fullest intention of following exactly whatever advice he would give. And Father John, with indefatigable sympathy and brimming love, would always take these people back into his great heart, sparing neither his time nor his strength, as he constantly tried to correct their mistakes. The story about the young boy and the operation reminds me of a similar incident that took place about ten years later. However, that incident ended in a completely different manner. In those years in Moscow there lived an unbelievably interesting and unique woman, Valentina Pavlovna Konovalova. She seemed to have walked straight out of the famous painting by Kustodiev—she was the spitting image of his portrait of the Moscow merchant woman that hangs in Moscow’s Tretyakov Gallery. She was a widow of about sixty years of age, and was the director of a large grocery warehouse on Prospekt Mira in Moscow. Stout and intensely earthy, Valentina Pavlovna could generally be found presiding at a large managers’ table in her office. Even during the severest epoch of Soviet anti-religious persecution, she kept framed paper reproductions of icons hanging on her office walls, and on the floor beneath her desk she kept a big cellophane bag stuffed full of cash. Valentina Pavlovna controlled this cash as she wished: sometimes, she would send her staff out to buy vegetables, and sometimes she would support beggars and wanderers and holy fools, many of whom gathered around her grocery warehouse for material support. Her staff was terrified of Valentina Pavlovna, but also loved her. During Great Lent, she would have general Unction services right in her office. These Unction services were always reverently attended by the Muslim Tatars who worked at the warehouse. In those years when groceries were scarce, she would sometimes be visited by abbots of Moscow’s monasteries, and even by archbishops. To some she was reservedly polite; to others whose “ecumenism” displeased her (that is, those not Orthodox enough), she could be curt and even a little rude. I personally was sent several times from Pechory to her grocery warehouse in Moscow with a big truck to buy food for our monastery for Easter and for Christmas. Valentina Pavlovna always welcomed us in a warm, maternal way. Having long ago buried her only son, she was particularly nice to young novices. We became friends, especially because we had one common theme for our discussions: our common spiritual father, Father John. Father John was perhaps the only person on earth who could make Valentina Pavlovna feel shy, even though she utterly loved and respected him. Twice a year she herself, together with her closest co-workers, would travel to Pechory, where she would fast and go to confession. On such days, she seemed unrecognizable—quiet, meek, timid, and in no way at all like a rich Moscow merchant woman, a mistress of this world. In the fall of 1993 major changes occurred in my life: I was appointed abbot of the podvorye (local representation or residence) in Moscow of the Pskov Caves Monastery. This representation was supposed to be located in the ancient Sretensky Monastery. But in order to execute a large number of documents, I often needed to be in Pechory. “No, no, not now—under no circumstances. Not now, let some time pass,” he insisted. When I got back to Moscow I passed along his words to Valentina Pavlovna. She was very upset. The procedure had already been completely arranged at the Fyodorov Institute, an elite and prestigious institution whose services were not easy to come by. And so Valentina Pavlovna wrote a letter to Father John, explaining in detail and once again asking for his blessing for the operation, insisting that it was a very simple procedure, hardly even worth paying attention to. Father John naturally knew just as well as she did how famous the Insti­tute was and how safe operations on cataracts usually are. Yet having read the letter that she brought to me, he became extremely worried. I sat with the old priest for a long time and in great distress he pleaded with me that no matter what, I must absolutely convince Valentina Pavlovna to refuse to undergo the operation at this time. He once again wrote her a long letter in which he simply implored her to listen to him. With all his authority as her spiritual father he blessed her decision to postpone the operation for a certain length of time. Later it would be all right, but not now . . . It so happened that back then I had just received two weeks’ leave. For over ten years I had never had any free time, and therefore Father John blessed me to go to a sanatorium to rest in the Crimea for two weeks. He insisted that I must take Valentina Pavlovna with me. He wrote a special letter to her about this, insisting again that she undergo the operation later, a month after her vacation. “If she goes through with the operation now, she will die,” Father John said sadly to me as I took my leave of him. “What other crazy idea has the Father gotten into his head? Vacation! And to whom am I supposed to leave the management of the warehouse?” She was truly indignant that Father John was “kicking up such a fuss” over a “routine procedure.” But as decisively as I could when it was my turn, I refused to listen to her, and told her that I was buying two vacation packages, and that we would be off to this nice sanatorium in the Crimea very soon. After a while it seemed that Valentina Pavlovna had agreed and calmed down. Several days passed. I received a blessing from His Holiness the Patriarch for my vacation, ordered two sanatorium packages (which were not hard to find at the end of autumn), and called the ware­house to inform Valentina Pav­lovna of the date of our trip. It turned out that a couple of days before a nun had stopped by the warehouse. In her secular job she was a doctor, and, having heard about the cataracts, she could not agree with the decision of Father John. Totally supporting Valentina Pavlovna’s desires, she had ignored Father John’s advice, and had instead sought out the conflicting blessing of the monks of the St. Sergius-Holy Trinity Lavra  of Sergiev Posad (Zagorsk) for the operation, and on that very day she received it. And so Valentina Pavlovna, quite content, went to the Fyodorov Ophthalmology Institute, counting on a simple operation, after which, in two or three days’ time, she would go join me in the Crimea. However, during the operation she suddenly had a terrible stroke, and became completely paralyzed. As soon as I heard of this, I rushed to telephone to Father John’s cell attendant, the monastery steward Father Philaret. In certain emergencies, Father John came to Father Philaret’s cell and used his telephone. What could I say to him in reply? Nothing . . . I asked only how we could help now . . . Valentina Pavlovna was still unconscious. Father John begged me to go to the church and bring to his cell the reserved Holy Gifts (the Body and Blood of Christ reserved for ministration to the ailing), and without delay I was to take her confession and give her Holy Communion once she regained consciousness—whether it be day or night. Through the nonstop prayers of Father John, Valentina Pavlovna regained consciousness the very next day. I was advised of this by her relatives, and within half an hour I was by her side in the hospital. She was brought into the intensive care unit of the hospital in a sort of metal stretcher. She was lying beneath a white sheet and was totally weak and helpless. When she saw me she closed her eyes and cried. She could not speak. But no words were necessary to understand her confession. I administered the last rites to her and gave her Holy Communion in farewell. On the next day, she once again received Communion from Father Vladimir Chuvikin, who had baptized me. That very evening she died. We buried Valentina Pavlovna in a transcendent and hopeful mood, and with peaceful feelings. According to ancient Church tradition, the soul of a person who takes Communion on the day of death immediately ascends to the throne of the Lord. Father John is also intimately connected with everything that involves the revival of monastic life in our own Sretensky Monastery. In the fall of 1993 during the commemoration of the Icon of the Iveron Mother of God, I came to visit Father John at an extremely difficult time in my own life. I had by then become a priest in Moscow’s Donskoy Monastery. But my relationship with the head of the monastery, Archimandrite Agathadorus, had been completely ruined, entirely as a result of my own mistakes, and I had no idea what to do or how to fix the situation. Father Agathadorus himself sent me to Pechory to see my spiritual father, in the hopes that he might solve my problems. Father John gently consoled me and urged me to have monk-like patience. Somehow he always found the right words. The main thing about him was his love for humanity, his faith, and his hope in God’s Providence. These were so great that even people coming to see him with what seemed like the most insoluble problems would leave his priestly cell full not only of consolation but of new energy with which to face life. And there was yet another extremely rare quality particular to Father John: his authority. He spoke as one having the authority from God to give others life force, and to lead them joyously to follow Christ. That time when I came back, we sat together for a long while. Evening Vigil service had already begun. Father John looked at his watch hurriedly and sent me to the church, saying that he would soon come himself. I and the other young hieromonks had already vested and were waiting for Akathist prayers to begin in the ancient altar in the cave of the Dormition Cathedral. Suddenly Father John walked up to us. I had just seen him half an hour ago, but now he looked totally different. His appearance was most unusual: highly focused and somewhat severe. I had never heard Father John say anything remotely like this. I didn’t even know what to say. On the one hand, it was quite clear that at this very moment my entire life was changing. On the other hand, I knew from all my prior experience that on this occasion what Father John was saying was totally unrealistic. A brief explanation is in order. At this time the Russian Orthodox Church had managed to revive 360 monasteries, and each month the number of monasteries was increasing. Naturally quite a few of these com­munities, especially the provincial ones, wish to have their own represen­tation in the capital, and their requests had by now so pestered the Patriarch that His Holiness at a recent gathering of his clerical administration had firmly warned that no such further requests were ever to be made of him. His reason for this was that if churches in Moscow were to be distributed to the various monasteries, soon there would be no local churches left for the benefit of local parishioners. I explained all of this to Father John. But he didn’t even lift an eyebrow. All through the Akathist, and throughout the evening service that followed, all I could do was worry about the words that Father John had just uttered. As soon as Evening Vigil service ended, I immediately raced to see him. Father John again several times repeated to me exactly what he had said up there at the altar, calmed me down, cheered me up, and bade me firmly, without any further doubts whatsoever, to act exactly as he had commanded. Father John never before nor after ever uttered such grand and terrifying words as “I will tell you the will of God.” He was not a man who spoke such—or indeed, any—words lightly. Therefore I took what he had said to me extremely seriously, and, overcoming my own fear, vowed to faithfully execute in every respect what I had been asked to do by my elder. When I got back to Moscow there soon appeared a convenient moment to meet with His Holiness the Patriarch. With my heart in my mouth, I passed along to His Holiness word for word what Father John had told me to say: that I be transferred from the Donskoy Monastery to the brotherhood of our Pskov Caves Monastery, that His Holiness bless the founding of a residence or representative church in Moscow of our Pskov Caves Monastery . . . and that I be put in charge of it. To my enormous surprise, His Holiness unexpectedly found the thought of establishing a Moscow residence for the Pskov Caves Monastery both timely and proper. As it turned out, just recently a question had arisen as to the creation of a special border area with heightened security for the town of Pechory, now located just three kilometers from the new border with Estonia. It appeared that there might be a problem with the free access of pilgrims in their usual throngs to the Monastery of the Pskov Caves. Therefore the idea of establishing a local Moscow residence could be a great help to the Church, in the Patriarch’s opinion, especially considering the possibility that the border police would make it difficult for pilgrims to get through to the original monastery. His Holiness therefore immediately commanded Archbishop Arseny (Epifanov) and Archpriest Vladimir Divakov to work with me to select a proper location for the residence. The first place they suggested for a residence was the Monastery of the Protection, which had recently been transferred back to the Church. I went there to admire it, but remembering the advice of Father John that I was to refuse the first church that I was offered, I excused myself from their offer based on the fact that the Protection Monastery was far too big for our needs. At that point Archbishop Arseny offered me two other addresses: the Cathedral of the Protection of the Holy Virgin Mary in Izmailovo, and the Sretensky Monastery on Lubyanka Street, in the heart of Moscow. The cathedral in Izmailovo also seemed to me far too big and grand in its decorations, while the Sretensky Monastery was just the right size, and exactly like what Father John had mentioned in his advice. Besides, it was not just a church, but a whole monastery, which had been closed down in 1925. Therefore it was a place where in any case it would be necessary to resurrect monastic life. I called Father Philaret in Pechory, and he connected me by telephone to my spiritual father. Eighteen years have passed since the time we founded this residence, yet always, in days of joy and grief alike, we have been supported by the prayers, blessings, and sometimes stern admonishments of Father John. He also gave us many of his own icons, including his very favorite, the icon of the Vladimir Mother of God. Father John blessed the creation of our own monastery publishing house, our own seminary, and our many supporting enterprises. And it must be said that, especially in our first and most difficult years, Father John watched over every step of our community as we were resurrecting it. And after concerns had subsided that border tensions might interfere with the possibility of pilgrims visiting Pechory, it was none other than Father John who blessed our asking His Holiness the Patriarch to transform our residence into the new and independent Sretensky Monastery. The brotherhood of the Sretensky Monastery reveres Father John as an elder, as the one who blessed the creation of our monastery, as our father in prayer, as our spiritual advisor and guide, and as our patron. Every day we utter prayers for the repose of his soul. His sermons, letters, and words of wisdom are like textbook reading for the brotherhood here in our monastery, as well as for the students of our seminary and for many of our parishioners. I particularly wish to remember how the souls of those people fortunate enough to have contact with Father John were transformed, literally as if reborn. But I find it difficult to recount all that took place during those twenty-five years in which I was blessed to know Father John. Indeed, even to assert that I knew him would perhaps be incorrect. In the end Father John remained entirely a striking and beautiful mystery. Sometimes he would reveal himself to us in such a way that we would be left utterly at a loss for words, only able to gape in astonishment. For example, I remember my enormous surprise when I once heard him quote a saying that came from imprisoned zeks (or persons who had been in the Gulag). What was more, the phrase was said so easily and casually, as if there were nothing unusual about it, that at first I couldn’t believe my ears. Once, in a sleepy country parish about a hundred kilometers from Pskov, my friend Father Raphael was visited by his nephew Valera. It was pretty obvious at once that the youngster had no religious inclinations, and he had certainly not stopped by to visit his uncle the priest in order to fast and pray. In fact, Valera was really just hiding out from the police. He did not keep his secret long but told us everything on the very first night. In his hometown he’d been accused of a very serious crime, but he assured us that he had not committed it. And although it was pretty obvious from first glance that he was far from an innocent lad, we believed his story this time. And in the end it turned out that his innocence was confirmed; Valera was proved to have no involvement in the foul deed for which he had been accused. “For what?” the boy cried out. Father John beckoned him with his finger to come closer and then whispered something in his ear. Young Valera staggered and stared at the good priest in shock. Then he asked Father Raphael and me to leave the cell, and the two stayed together alone. Half an hour later, when Father John asked us to come back, Valera was sitting on the little sofa. We could see that he had been crying, and yet, for the first time in all the days that we had gotten to know him, he seemed radiant and absolutely happy. Father John, having taken the boy’s confession, was removing his epitrachelion (an Orthodox stole) and cuffs. Father John asked us to help Valera to fast and pray for three days in the monastery, to receive Unction, and take Holy Communion. After this Father John blessed him for his return to his hometown of Chistopol. “Why?” we asked. But it seemed Father John had already explained everything to the boy—or all but one thing. Father John knew what he was talking about. Father John was arrested. He languished for about one year in “pre-trial detention, in dark interior cells of the KGB’s Lubyanka Prison in solitary confinement.” Throughout that time, during endless “interrogations,” he was routinely tortured. During these “interrogations,” Father John admitted that lots of young people did indeed gather around him. However, he maintained that, as a pastor in a church, he could not possibly turn them away just because they were young, nor could he agree to cease paying attention to them. As for the Komsomol, the arrestee Krestiankin also conceded that he did not accord his blessing to those who wished to enter into that organization, because it was an atheist organization. No true Christian could ever possibly be part of such groups. But as to having allegedly carried out anti-Soviet agitation, he denied his guilt, saying that as a priest such secular activities did not interest him. Never, throughout the entire time that Father John was in prison and was being tortured, did he utter one name or betray a single friend. He knew that any name that he was likely to mention would immediately get that person arrested. At some point later Father John told us about his interrogator. They were both the same age. In 1950 they had both turned forty. And the investigator had basically the same name that he did, Ivan. They even had the same patronymic—Mikhailovich. Father John told us that he mentioned his interrogator every single day in his prayers and would never forget him. “He broke every single one of my fingers!” Father John exclaimed, showing us his hands, which had been maimed during the tortures. In order to finally break the will of this “criminal priest,” the secret police interrogator Ivan Mikhailovich set up a confrontation between Father John and the head priest of the church that Father John had served in. Father John already knew that this man had betrayed him and was the reason for his arrest and all his immense sufferings. But when the head priest came into the room, Father John was so glad to see his brother and fellow priest, with whom he had so often performed the Divine Liturgy, that he simply threw his arms around him! The head priest quivered in the embrace of Father John, and promptly fainted. The confrontation did not work out as planned at all. Nonetheless, even without the evidence of his accuser—indeed, without any evidence or confession of guilt at all—Father John was sentenced for anti-Soviet agitation to eight years in the camps of the Gulag. It was written somewhere about one of the ancient Holy Fathers of our Church that, from the abundance of love that he had in his heart, he had totally forgotten what evil was. And we, young novices, in those years often reflected on why it was, or for what achievements and spiritual qualities, that God gave to his true servants certain gifts of prophecy or miraculous healing or ability to know His will. After all, it was difficult to even imagine that this man to whom people would open their hearts and reveal their most intimate thoughts and deeds could ever have been different than the way he was, limitlessly compassionate to everyone without exception. It simply could not be imagined that his heart would not have been full of this powerful, mysterious, and all-forgiving love, which was brought to us in this world by the crucified Son of God. As for the history of Father John’s years of imprisonment, what always struck me most about his story was the way in which he described the time he spent in those truly awful camps, so full of cruelty and suffering and callousness. Believe it or not, Father John would say that these were the happiest days of his entire life. “Because God was always close by!” With joy Father John would exclaim this, although without doubt he realized that there was no way we could possibly understand him. In the monastic cell where Father John used to receive his numerous visitors it was always very noisy. Father John would fly in—yes, fly in—even when he was seventy and eighty years old, even when he was ninety, even when he was growing feeble with age, still, he would literally run to his icon and for a moment, not paying attention to anyone else, would freeze before it, totally immersed in prayer for the people who had come to see him. Only having finished this main task would he turn to his guests. Every one of them would receive his joyous glance, and he would hasten to bless each and every one. To some he would whisper something, for others, he would worry . . . he would explain . . . he would console… he would complain, and he would encourage . . . He would groan and sigh, he would wave his hands . . . More than anything else, in these moments he would resemble a brood hen fussing about its chicks. Only after finished with all of this would he practically collapse on his ancient little couch and sit down beside his very first visitor. Each of these visitors of course had his or her own problems. I won’t speak for the others, but I well remember those problems with which I myself came to the good father. As he finished, Father John prayed to his beloved icon of the Mother of God, called “Search of the Lost,” that hung in his cell, and then commanded me to hurry home. As soon as I received my mother’s blessing, I was to take monastic vows (receive the tonsure) from His Holiness the Patriarch. Because of the prayers of Father John, this time my mother unexpec­tedly agreed to give her blessing to my desire to take monastic vows, and blessed me herself with the icon of the Mother of God. And then His Holiness the Patriarch Alexiy II sent me to take my vows in the then still-sparse brotherhood of Moscow’s Donskoy Monastery. Father John’s promise about my receiving a gift also came true. It so happened that the Abbot of the Donskoy Monastery, Archimandrite Agathadorus, who had twice put off the occasion of my taking my vows because of urgent monastery business that required him to travel, finally administered my monastic vows exactly on my birthday, just when I had turned thirty-three. Now, instead of my given name Georgiy Alexandrovich Shevkunov, I was to take the new name Tikhon—after my favorite saint and the beloved patron of the Donskoy Monastery. There’s quite a lot that I can still remember. Soon after the death of Valentina Pavlovna Konovalova, I was hospitalized. It was quite a serious illness, and Father John, in the letter that was passed along to me by his spiritual daughter Nastya Goryunova, authorized me to break the long Christmas fast and eat both fish and dairy products. My friends at that time had put me in an excellent clinic. There was even a television my hospital room. As I began to recover a bit I decided to watch the news on television, which I had not watched for several years. And then I watched an interesting film. Later that day, in the evening, Nastya Goryunova arrived from Pechory, and, through the nurse, passed me a new letter from Father John. I can still remember how I received his letter, lying lazily in bed, watching some film or other on TV. I was even watching it and reading Father John’s letter at the same time. Then, at the end of the letter there was a postscript: “Father Tikhon, I gave my blessing for you to relax about keeping the fast, but I do not give my blessing for you to watch television.” I rolled like a peg-top out of bed and ripped the cord connecting the television out of the power socket. By this time I knew only too well what would happen if one did not obey Father John. One priest from Moscow, who was a former spiritual son of Father John, once came to me with a rather strange request. I was to return an epitrachelion or stole, the symbol of priestly service, that Father John had given to him with blessings and parting words of wisdom before his ordination. This priest told me frankly that he had become disenchanted with Father John, because the latter did not support his dissenting views on clerical matters. How many bitter words this priest then spoke! And yet it seemed he took absolutely nothing into account: neither the many years that Father John had suffered for his faith in the Gulag camps, nor the fact that he had undergone torture and had never been broken, nor the fact that Father John had never toed the line of Soviet conformity—and indeed, no one could possibly accuse him of such a thing. Later on this priest who complained about him left for a different Orthodox jurisdiction, which he also disliked. And then he joined a third—and so on. And here is yet another testimony, the memories of an elderly Muscovite, Adrian Alexandrovich Yegorov. 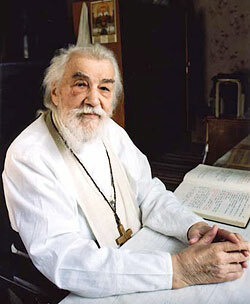 He writes: “I was acquainted for the better part of my life with the late Patriarch Pimen. Once I asked him what a spiritual father is and what it means to be one. He answered me that in all of Russia there is perhaps only one true spiritual father— Father John.” Indeed, Patriarch Pimen always invited Father John to stay with him in his country house in Peredelkino during Father John’s rare visits to Moscow. And then they would converse for a long time together. Father John had great reverence, love, and respect for the hierarchy of the Russian Orthodox Church. He felt deep within his soul that higher truth on this Earth can only be found in the Church. Father John would brook no schisms, no rebellions or questioning of dogma, and would always fearlessly speak out against such things, even though he knew quite well how much slander and sometimes even hatred this would force him to undergo. He was truly a man of the Church. Many times he would command an act be done exactly as His Holiness the Patriarch would decide, or as the bishop would decide, or as the abbot of the monastery would decide, even though he disagreed. At the same time, this absolutely did not mean that he was an unthink­ing, unquestioning automaton of soulless obedience, not at all! I remember a time when one of the monastery abbots and the presiding bishop tried to convince Father John to give his blessing to a decision they had already made even though Father John was utterly opposed to this decision on principle. These worthies demanded that he give his authority as an elder to their command. And yet his vast experience of ecclesiastical life (he had begun as a young child, serving as an altar boy at the age of four) gave Father John the confidence to be able to declare that nothing good whatsoever would come from their demands and therefore he simply could not give his blessing. They began to insist, putting quite heavy pressure on him—you might say they put the knife to his throat. Priests and monks know all too well what folly it is to defy the will of the ruling bishop and head the of the monastery, the abbot. Father John bore with grace and patience their siege of many days. All the while he patiently explained that he simply could not give his blessing to something to which he could not agree in his soul. If those in charge and of superior rank truly believed that it was necessary to act as they requested, he would meekly abide by their decisions, for it was they who would bear responsibility before God and our brotherhood. But in this case, it was clear that the commands they were giving were coming entirely out of pique, from their passions, and therefore he could not give his blessing to something like this—in all humility, he simply could not. Generally all those who remember Father John recall that he was kind, affectionate, good, and loving. There can be no doubt that in all my life I have truly never met any other man who better knew how to express his fatherly Christian love. And it must also be said that Father John, when it was necessary, could also be quite strict. Father John was never afraid to speak the truth to someone’s face, and would always do so expressly for the benefit of the person to whom he was speaking—whether a bishop or a simple novice or someone from the outer world. His firmness and spiritual principled integrity had been foundations of the soul of Father John since his early childhood, when he had had the fortune of being in contact with great spiritual authorities and future new martyrs of the Holy Russian Orthodox Church. Here’s another example of a similar situation which I have dragged out from the warehouse of my memory. At the time I was only 12, but the impression that I received was so powerful that to this day I can see it all happening before my eyes, and remember all the main actors by name. In the town of Oryol, we happened to have a remarkable archbishop, Seraphim Ostroumov. He was the most intelligent, kind, loving and modest man; I cannot begin to count the complimentary epithets that he deserves. It is as if his entire life prepared him for the laurel of a holy martyr, and that is what in the end happened to him after the Revolution. Well, once, on Forgiveness Sunday (the Sunday before Lent, when everyone is supposed to ask for and give forgiveness to everyone else) this goodly archbishop drove out of his monastery two of its inhabitants: Abbot Callistos and Deacon Tikhon. He kicked them right out for some misdeed or other. He did this publicly and with great authority, firmly keeping all others from any temptations of even associating with them. Immediately afterwards he pronounced the words of forgiveness for the Sunday of Forgiveness and asked for forgiveness from all for all . . .
My still youthful consciousness was totally shocked by what I had just seen, because of the utter contrast: on the one hand, an act of driving out from the monastery, in other words, the absence of any forgiveness, and yet on the other hand, his meek plea for forgiveness for himself and others from all and to all. At the time I only understood one thing: that sometimes punishment can be the beginning of forgiveness, and that without punishment forgiveness may be impossible. Now more than ever I revere the courage and the wisdom of the remarkable Archbishop Seraphim, because the lesson that he taught me and the others stayed with all of us, as you can see, for the rest of our lives. Father John was always unshakable and joyful in his faith in the most valuable and obvious of higher truths: that the life of a Christian on earth and the life of the heavenly Church were bound by unbreakable spiritual threads. And this faith of his was most touchingly confirmed in the hour of his death—as significant for Father John as it is for any other mortal. Father John left us to meet his Lord in his ninety-sixth year of life. It happened on a feast day that was particularly important specifically for Father John—the commemoration day of the new martyrs and confessors of Russia. Many of these saints who gave their lives for Christ during the cruel persecutions of the twentieth century had been his teachers and closest friends; in a way, he too was among their number. And so it was fitting that on the Feast of the New Martyrs of Russia, on the morning of February 5, 2006, just after Father John had received Divine Unction and received the Holy Mysteries (Communion) of Christ, the Lord summoned Father John to His presence. But even after the death of Father John, those who had the good fortune of having known him can still feel his love, his support, his prayers, and care. And they will never leave us—even when Father John is in another world. In 2007 the name day of His Holiness Patriarch Alexiy II happened to fall on the very first Sunday of the Lenten Fast, which is the day we celebrate the Triumph of Holy Orthodoxy. We in the brotherhood of the Sretensky Monastery had spent all the preceding week in unforgettable services marking the first somber week of the Lenten Fast. On Saturday after the Liturgy, guests began to appear for the celebration of the name day of the Patriarch. The time before Vespers and even after, till late into the night, was full of concerns such as welcoming and finding rooms for the monks, priests, and archbishops who usually stay with us in the Sretensky Monastery. When we were finally exhausted and desperately wanted to sleep, I decided that I would read the required canons and prayer rule for Communion in the morning. But to my great shame, I overslept, and now suddenly I was driving to the Cathedral of Christ the Savior for Liturgy not having completed the required prayers. Two or three times in the twenty years in which I have served as a priest I have had to administer a service not having been prepared for it. Each time there simply have been no excuses, no mitigating circumstances of weariness in particular, nothing that could possibly drown out the cruel reproaches of my conscience. But now I nonetheless tried to convince myself that well . . . after all . . . even though I hadn’t read the required prayer rule . . . still, I had, in fairness, spent the entire week, morning, noon, and night, praying in the cathedral. And on Wednesday, Friday, and Saturday—in other words, literally as late as yesterday—I had taken Communion and had followed all the rules and said all the required prayers. The Metropolitan was referring to a documentary film that I had made about the Pskov Caves Monastery, where there were many scenes featuring Father John. It so happened that Archimandrite Dionysius Shchigin was standing next to me. I approached him and told him the entire story: both about my lack of preparation and about the conversation that I had just had with Metropolitan Varnava. I confessed all to Father Dionysius, and together we marveled at how great and mysterious was the Providence of God. Who knows what it was that we had just witnessed? Perhaps Father John through the Metropolitan had yet again taught a lesson to “one of his foolish children,” as he once called me in one of his letters. Or maybe it was that yet again we had met yet another of those priceless, hidden ascetics and servants of the Lord, whose faithful ranks will never thin in Christ’s Orthodox Church. A klobuk is a cylindrical hat worn by monks in church. Lavra is the name given to a monastery of exceptional importance.The Holy Trinity-St. Sergius Lavra is historically one of the most significant monasteries in Russia, founded in the fourteenth century by the great St. Sergius of Radonezh. There were so-called “Church dissidents” at that time, who spoke out against conformism among the Russian clergy with the Soviet regime.